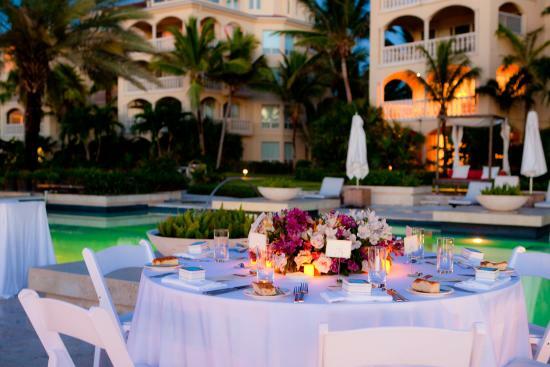 Grace Bay Club was Grace Bay Beach’s first all-suite hotel in Providenciales, Turks & Caicos, founded in 1993. Spread out along 11 acres of groomed beachfront, the luxury resort has received accolades from Conde Nast Traveler and Travel + Leisure, including Reader’s Choice “Best in the World.” While luxurious, the resort also remains family friendly, offering a variety of suites to accommodate families of all sizes, and children’s programs for kids’ to enjoy with or without mom and dad. 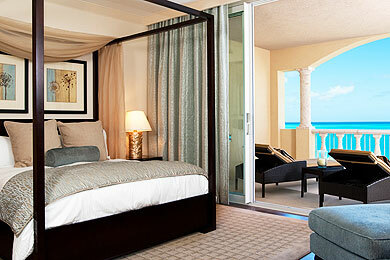 Grace Bay Club features 82 suites 600 square feet or larger, all featuring oceanfront views. The resort features four accommodation categories, each with distinctive touches. While The Hotel is the adults-only category, families can enjoy The Villas, The Penthouses or The Estate. The Villas feature 38 suites ranging from 2,300 to 2,800 square feet. Situated along 50 feet of shoreline, the suites feature fully equipped kitchens. The Penthouses, as expected, are luxury suites, 3,600 square feet in size. Situated along 100 feet of shoreline, the penthouses also feature 1,000-square-foot, oceanfront terraces. With two master bedrooms, a media room and private outdoor hot tub, the suites provide room for multigenerational travel or larger families to share, including fully equipped kitchens. The Estate is the resort's hotel-within-a-hotel concept with 22 custom-designed suites. Guests of the Estate have access to all facilities on the property, but also have a private pool and restaurant not accessible to other guests. Accommodations range from 800-square-foot junior residences to the 7,000-square-foot penthouse and also feature outdoor showers. All rooms feature ceiling fans, central air-conditioning, free Wi-Fi, DVD/CD player, iPod docking stations, refrigerators with ice makers, and kitchens or kitchenettes. Grace Bay Club is perfectly situated on the most desirable section of one of the most beautiful beaches in the world. 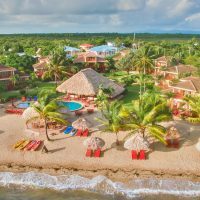 The impeccably maintained grounds are stunning, and generously sized suites are well appointed with decor befitting a luxurious Caribbean resort. While the resort grounds and location are first-class, the same cannot be said of the service. The best way to describe the service is "hit-or-miss" with more "misses" than "hits". Whether at breakfast, lunch or one of several towel stations, there was never a shortage employees standing around, socializing, and making every effort to avoid eye contact with the patrons. Breakfast was perhaps the worst. There were often more waitstaff than hotel guests, yet it was it was almost impossible to get anyone's attention. When we finally did place an order for something that was not readily available on the buffet, for example a cup of coffee, it could take a solid ten minutes for someone to return. When asking the waitstaff for something more esoteric, for example, a cup of hot chocolate or ice in a to go cup, we were often given a stare in disbelief as if we were asking them to climb Mt. Kilimanjaro barefoot. Overall, the resort is beautiful and has the potential to be world-class destination. Unless the management addresses the inconsistencies in staff training and prioritizes quality over quantity (vis-a-vis staff), it is unclear to me that people will continue to pay top dollar once viable competitors come to town. Beautiful property all the way. If cost is not an issue this is the place you want to be. Pools are over the top for pleasure and views. Food is very good. The Infinity bar is one of the most picturesque in the Caribbean. 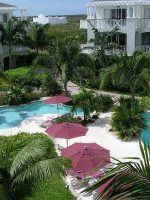 The resort is situated along 11 acres of Grace Bay Beach. Only one of the three pools is available to all younger guests, who can access The Estate pool if they are a guest of The Estate. All non-motorized water sports, including Hobie Cats and paddleboards, are offered for complimentary use. 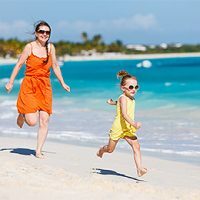 The beach beds are available free on a first-come, first-served basis, and guests won't have to struggle to find beach chairs or umbrellas, as they are more than ample at both the pools and the beach. Kids Town is the resort's supervised program for children 5 to 12, which runs daily from 9 a.m. to 4 p.m. A colorful "tree house" provides a cool place for indoor games and borders a sandy playground with rock climbing wall, but the majority of programs are held outdoors on the beach and the resort grounds, to connect children to the environment and give them the water fun they crave. Field trips to the Conch Farm are made weekly and kayaking and paddleboarding are part of the program, too. Teens age 9 to 12 are offered a number of excursions (for a fee) and social events. Onsite watersports, mocktail and bonfire parties, and a sunset reggae cruise will keep teens (and parents) happy. Bicycles are provided by request and are free for daytime use. With rooms equipped with DVD players, families can check out videos at the library, which also features books and board games, all provided for free. A casual beachside bistro, the Grill Rouge is open for breakfast, lunch and dinner, with breakfast included in room rates. A kids' menu provides popular selections for little ones, while those with a larger palette will enjoy sandwiches, salads, and grilled seafood. For guests who fish during the day, the restaurant will clean and cook a catch for the family. The exclusive restaurant of The Estate, serves gourmet fare in a casual setting, including poolside and at poolside cabanas. 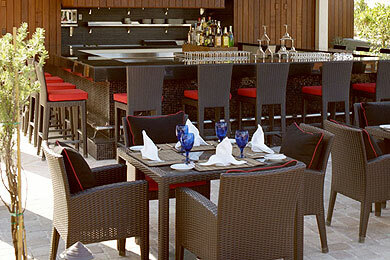 Krave serves lunch and dinner and is open to all Grace Bay Club, including children. A children's menu is also offered. The premier oceanfront restaurant is open for dinner form 6 to 9 p.m. Children are welcome and a kids' menu is available. Many accommodations at Grace Bay Club are suites that feature full kitchens or kitchenettes so families can stock up at the local grocer and prepare meals in-room. Room service is also available during restaurant hours. As a family-friendly resort, hotel staff will be happy to provide childproofing prior to your arrival, per your request. Babysitting service can be arranged through the resort's Kid Town program. 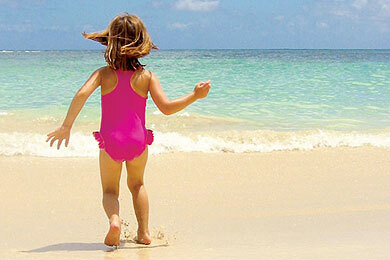 Babysitting service can be arranged through the resort's Kid Town program. And the resort will also recommend a nanny service if requested. The resort's peak season is the Christmas holiday season. Ten-day minimum stays are required during this season. Spring Break is the second busiest period, when the resort is often sold out. Low season for the resort is during the summer and fall months. 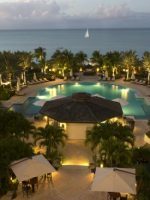 Although hurricane season, Turks & Caicos often remains free of weather woes during these months. Average daily temperatures remain low 80s throughout the year. 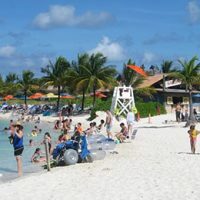 The resort is located on Providenciales and its international airport, which is serviced by Atlanta, Charlotte, N.C., Dallas, Miami, New York City, Philadelphia and Montreal and Toronto. Passports are required for entry to the island, which is a colony of the United Kingdom. The official currency is the U.S. dollar, and the official language is English. It's easy to walk around the resort but a stroller may be a good idea for younger children. Parents can enjoy the adult-only Anani Spa, which features six treatment rooms, including a couples' room, as well as a nail salon and a relaxation room. For golfers, the resort provides free transportation to nearby Provo Golf Course, an 18-hole, par-72 course just three minutes away from the resort.